Michael O’Reilly is the boxer at the centre of reports of an alleged violation of anti-doping rules ahead of the Olympic Games. The Irish Athletic Boxing Association confirmed that an Irish boxer had been provisionally suspended from competing at Rio 2016 after testing positive for a banned substance. The IABA was notified by Sport Ireland today of the alleged violation of Irish anti-doping rules. The boxer, who has yet to be officially named, can request to have a B sample tested but cannot participate in any competition or activity prior to the completion of an investigation under Article 8 of the Irish anti-doping rules. The Olympic Council of Ireland also confirmed the failed doping test, while withholding the name of the boxer implicated. 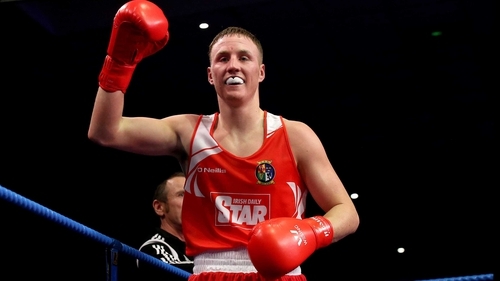 The International Boxing Association stated earlier today that it had not been informed of an Irish boxer having tested positive for a banned substance. The AIBA said that as the test was carried out in Ireland in the run-up to the Olympic that it was up to the national federation to inform the world governing body. O’Reilly was due to fight in the middleweight division at Rio 2016. The Portlaoise fighter was crowned champion in his weight class at the European Games in Azerbaijan in June 2015 and claimed a bronze medal at the World Championships in Qatar four months later. O’Reilly only secured a berth at Rio 2016 at the eleventh hour when he won gold in a late qualifier for the Games. ​​​​​​RTÉ analyst Mick Dowling expressed his astonishment at the revelation, telling viewers of Six One news: "Michael O’Reilly should be well aware, as all the boxers and athletes are, that you are responsible for what you put into your mouth and you consume. “It’s very, very disappointing that this has been a positive test on a day that we should all be excited about the draw. We should be excited by who is going to go through. Adam Nolan, who represented Ireland at the 2012 Olympics in London, was in the 2FM studio this evening and told Game On listeners that Ireland’s coaching team now had a critical role to play in ensuring the nation’s fighters maintained their focus in the wake of the controversy. “The coaches that we do have out there are top-class, world-class coaches,” he said. “They will keep the boxers focused on the job in hand. “John Conlan, Eddie Bolger, Zaur Antia, they have a job to do. Speculating on the O’Reilly’s fate, he opined: “Michael has the right to have the B sample tested, but in the meantime he’s provisionally suspended. Elite athletes have to negotiate a complex minefield in terms of being aware of what drugs and supplements are permitted by the authorities, but the five-time national champion was clear that those that fall foul of the rules only have themselves to blame. “Whether it’s performance enhancing or recreational, we don’t know, but it’s carelessness on the boxer’s behalf,” he insisted. “The setup in Ireland is strenuous. You could get tested eight, 10, 12 times a year. “There is a website available for all Irish athletes. If you are unaware of what you’re putting into your system, whether it be some sort of supplement, there is a website Where you can check it. The Irish Athletic Boxing Association (IABA) has been notified by Sport Ireland today of an alleged violation of the Irish Anti-doping Rules committed by one of the boxers in our High Performance Unit. In following the strict procedures applying to an adverse analytical finding, the athlete in question has been informed and is provisionally suspended. The boxer can request to have a “B” sample tested but cannot participate in any competition or activity prior to the completion of an investigation under Article 8 of the Irish Anti-doping Rules. The Irish Athletic Boxing Association will not be in a position to comment further until all elements of due process associated with the anti-doping programme are completed in this case. “The Olympic Council of Ireland can confirm that the Sport Ireland Anti-Doping Agency has returned an adverse analytical finding in an A-sample provided to anti-doping officers. “The finding relates to a test not conducted at the Rio 2016 Olympic Games. The athlete has been provisionally suspended from competition and can take part in no sports activity, including training, in accordance with the WADA Code. “The athlete will now decide whether to accept a sanction for a doping violation, to request that a B-sample be tested, or to appeal the provisional suspension.